Slowly over the course of time, mankind began to use symbols and signs on parchment and stone tablets to keep records of shop inventories and livestock. Many of the first ever discovered examples of human writing have come in the form of businesses trying to keep their goods organized. So, they devised a system that has lasted the test of time and that is still used on special occasions today: the Roman numerals. Perhaps the most interesting part of Roman numerals is that they're a numbering system similar to the Arabic numerals used around the world today, but with one key difference: the placement of the numeral can indicate either subtraction or addition. 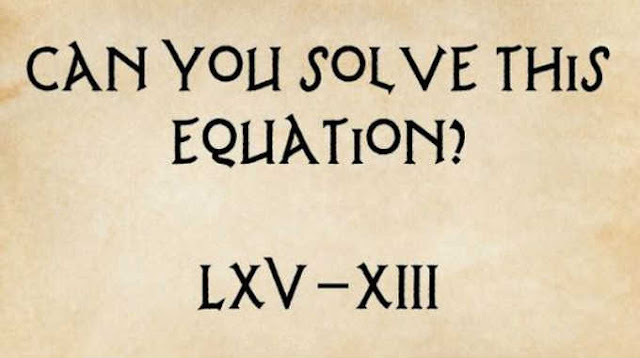 Try your hand at this ancient roman math quiz and see how well you know your Roman numerals. Only 12% of people who take the quiz typically pass it, so if you don't get it right the first time, it's okay! And be sure to share with friends and loved ones who you think would get a kick out of this fun brainteaser!